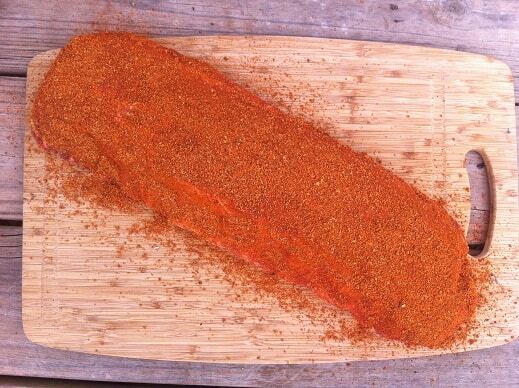 Best Rib Rub: Three Killer Blends You Can Buy Today! I embarked on a quest to find the absolute best rib rub and almost killed myself in the process. It happened on February and only now, months later, am I able to speak of these events. I was spending a beautiful Sunday evening surrounded by family and friends when I abruptly realized that I had suffered a rib overdose and was falling into a pork induced coma. The worst part was the shame; the pure humiliation of realizing that I wasn’t man enough to eat one more bite of ribs. What led up to this tragic turn of events? I should have learned from Ahab; epic quests for the elusive beast will leave you a broken man. I lost track of how many racks of ribs I had gone through; at least twenty, maybe thirty. 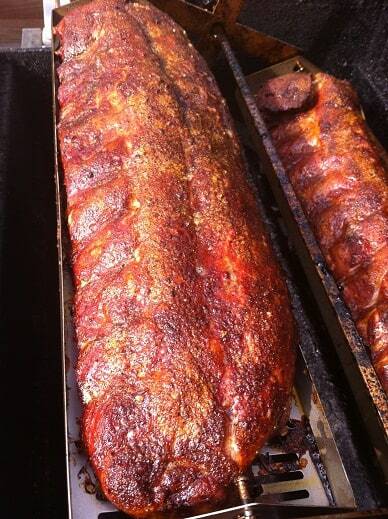 We had cooked multiple slabs every weekend for weeks on end. On weekends I ate them straight from the grill. During the week I had leftovers for lunch…and dinner. 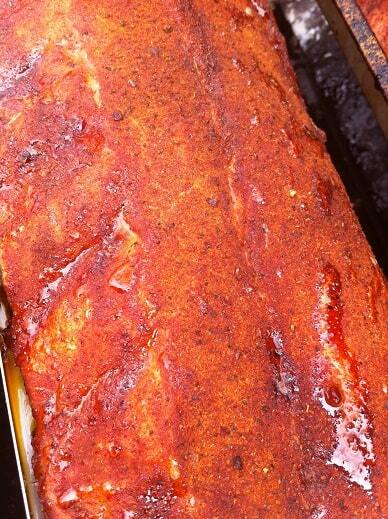 Each slab of ribs was thickly coated in a different commercial rib rub. I took lots of pictures and did a lot of talking to myself; some rubs were glorious, others were hideous. Before I show you the best rib rubs I need to talk a little about how the ribs were cooked. The short summary is that the ribs were completely covered in huge amounts of rub then slow cooked while getting sprayed with a little apple juice. There was no wrapping in foil with honey and brown sugar. The rib rub had to provide ALL of the flavor. 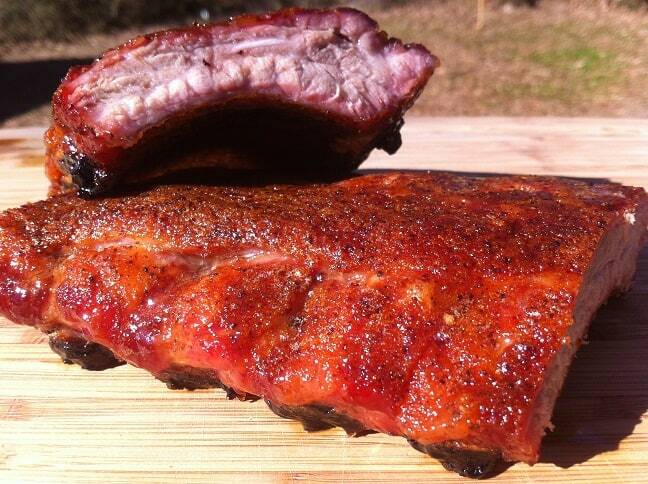 Since many of the rib rubs evaluated had salt as the primary ingredient they did not do well in this evaluation. 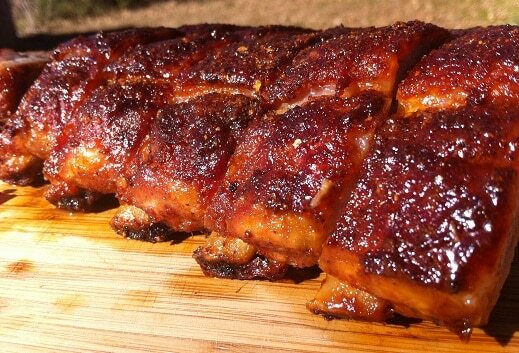 Salt based rib rubs work great when foiled with something sweet but as standalone products they just don’t hit the mark. Here is what a typical cook looked like. 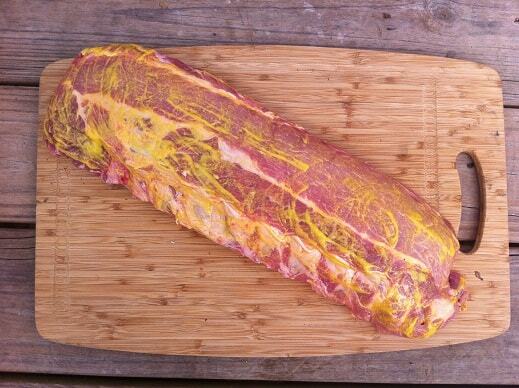 I started with a slab of baby backs, removed the membrane from the back and coated the ribs with yellow mustard. The ribs were then thickly coated with the dry rub, loaded into Rib-O-Lator trays and rested on the counter for an hour so the rib rub could dissolve into the meat. The Rib-O-Lator trays were then loaded onto my Weber Genesis rotisserie. I set the back burner to medium-low and had the front two burners off. I added a chunk of hickory directly over the lit burner, closed the lid and let the ribs spin. 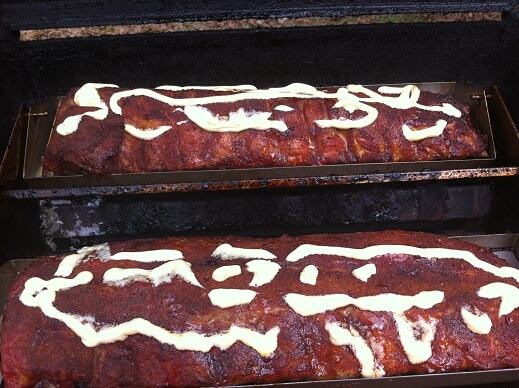 FYI..the Rib-O-Lator makes cooking multiple slabs of ribs EASY!! After two hours the rub had pretty much set up on the ribs and I started spraying them with apple juice every 30-45 minutes. 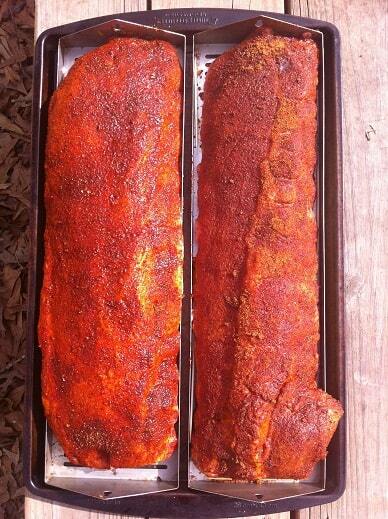 After two hours the rub will set and the ribs will look dry. Start spraying with apple juice to keep them moist. At the three hour mark the ribs would get a nice squeeze of Parkay. Yes, I know that Parkay is strange…it works from me when I am using a gas grill. The ribs would keep getting spun and sprayed until the meat pulled back from the bone about half an inch and a toothpick would easily slide through the meat. All told it took about a little less than five hours to cook the ribs on the Genesis. Alright, so that’s how we cooked them; now let’s talk about how they tasted! 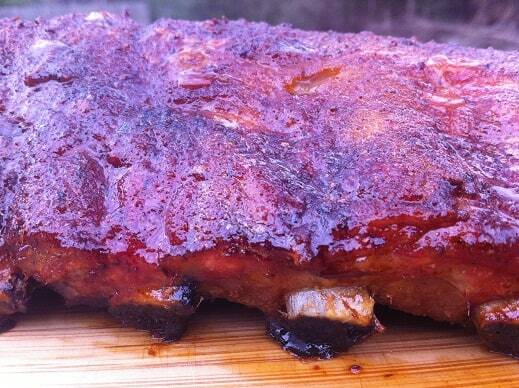 Without further delay here are the three best rib rubs that we tested. Flavor: A really nice balance of sweet, salty and savory with a little bit of heat on the back end. 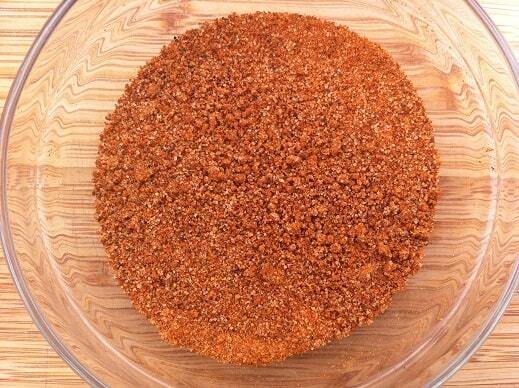 This rib rub comes from the folks over at Kansas City Cowtown. These folks won two Grand Championships at the American Royal (1993, 1995-Slaughterhouse 5). They also make some incredible sauces with one of them being named Best Sauce on the Planet in 2001. 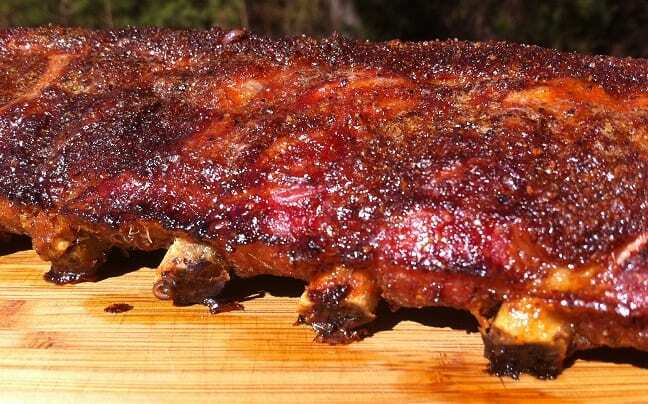 Kanasas City’s Cowtown Sweet Spot Barbecue Rub is a fine product. I would not hesitate to use it again. Flavor: Sweet and mild are the first impressions followed by onion and smoke. The flavor starts in the middle of your tongue and works its way through your mouth. There is no bite or heat with this rub. 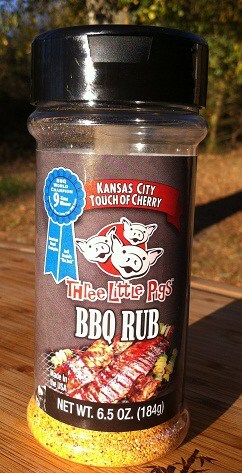 This is a product from Chris Marks of the Three Little Pigs BBQ team from Kansas City, MO. They have won in the American Royal eight times (combination of Grand Champions and Reserve Grand Champion) and in the Jack Daniels World Championship once (Sauce). There is no information indicating if this product is MSG or Gluten free. They have a catch all ingredient of “Natural and Artificial flavor” that makes it impossible to know what is really in there. This is a great product. My son’s comment when he tackled his first rib from this batch was that if it had a little bbq sauce it would be perfect. 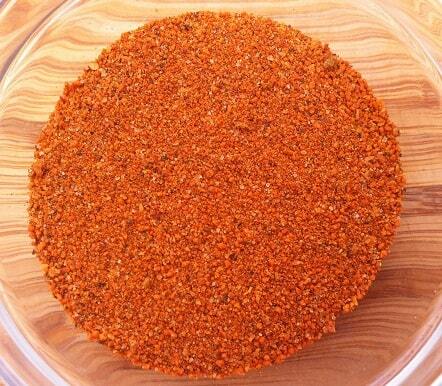 If you are looking for a “Sweet Heat” rub then this rib rub isn’t for you as there simply is no heat present. I wouldn’t hesitate to buy this again. Flavor: Amazing! The flavor profile is best described as a multi-layered taste sensation. The first thing I taste is the tangy bite of the citric acid. This is followed by a quick sweet and salty shuffle that blends with some nice aromatics and then suddenly the tongue starts to tingle from a little bit of heat. 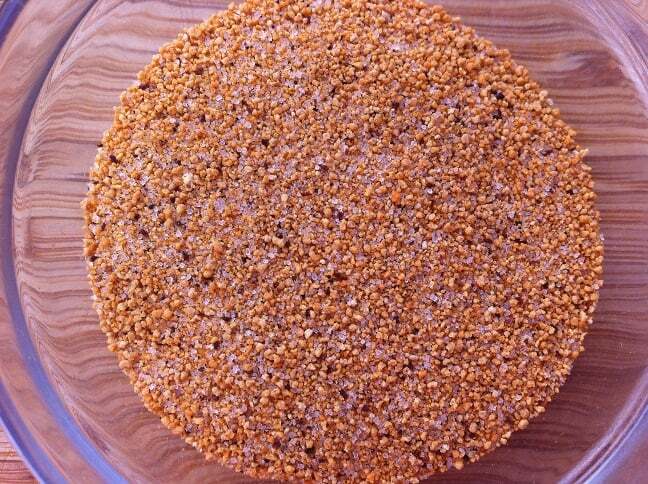 The HOT version of this rub actually tied for third place in our taste tests. 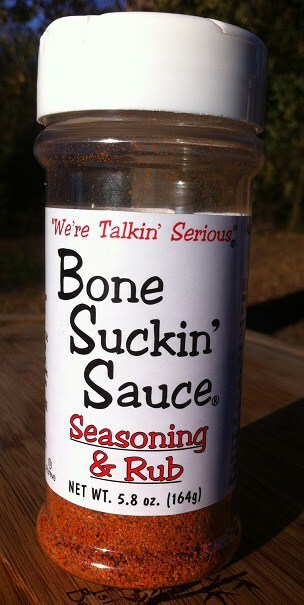 Bone Sucking Sauce is MSG free and Gluten free. This product is also certified Kosher but if you are cooking ribs I am guessing that this probably isn’t very important to you. This is far and away my favorite commercial rib rub. It also excellent on baked catfish…just in case you were curious. 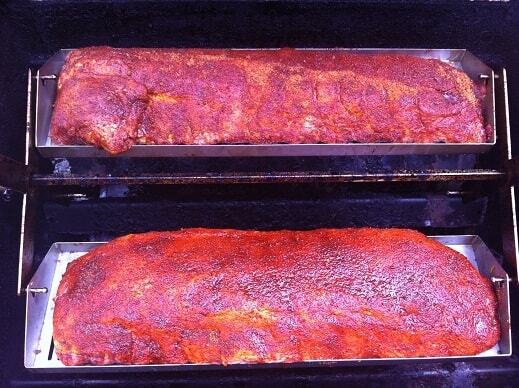 If you want to try these rib rubs yourself here are the links to purchase them on Amazon. I am sure that there are some great products out there that I have missed. Please, do us all a favor and let me know all of the great rib rubs that should have made the list but didn’t! 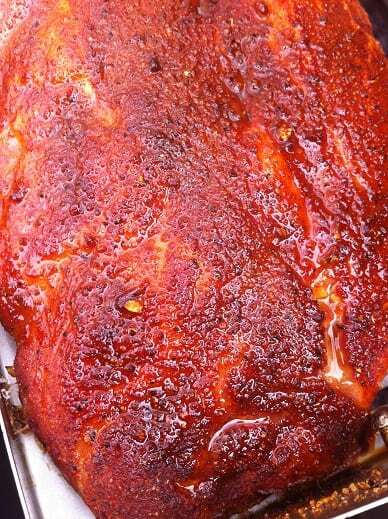 I bought a rub recipe on line from Jeff Phillips at Smoking meats.com and I have to say its pretty darn good. Low salt. Sweet heat. It is a little heavy on the paprika so I modified it slightly to my taste. Texas BBQ is different than everywhere else. But it world well on anything and everything I have put on the grill or smoker. Jeffrey, thanks for the lead on the product! I appreciate you dropping by!